On August 17th, 2011, Canada Post will begin issuing a new stamp series commemorating important Canadian innovations. You may be surprised to learn which objects used in your day to day life have a ‘Made in Canada’ stamp on them! 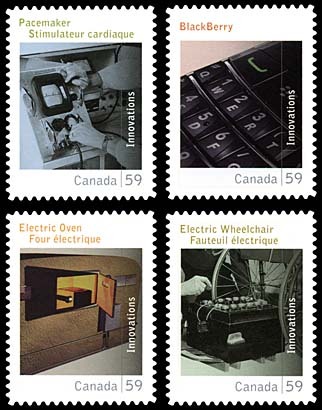 These stamps will feature the following inventors and their inventions: Thomas Ahearn-the electric oven and stove, George J. Klein-the electric wheelchair, Dr. John Hopps-the pacemaker, and Mike Lazaridis-the Blackberry. Born in Ottawa in 1855, Thomas Ahearn grew up to work in telephone companies and eventually establish his own company as an electrical contractor. After much time, he invented the first electric oven and stove, albeit not as we know it today. The first oven was over 6 feet high and wide and hot enough to ‘roast an ox’, as the press put it at the time. The first oven was unveiled at the Ottawa Windsor Hotel where a dinner was cooked on it featuring ham, lamb cutlets, apple pie and chocolate cake, among other items. Unfortunately, Ahearn’s oven didn’t catch on. Electricity was not widely available yet and the appliance was much too bulky to be practical. As the years passed, technology was greatly improved and finally the first oven made it into a home. Though his oven is not the one we have today, we can still thank Mr. Ahearn for his vision of the kitchen of the future. Born in Hamilton, Ontario, George Klein became an inventor in Toronto and eventually worked for the National Research Council of Canada. Sadly, as is often the case, it was the advent of war that brought about the invention of the electric wheelchair. After World War II, more and more veterans were coming home missing legs or paralysed and were prevented from returning to a meaningful life by the bulky and difficult to manouever wheelchairs of the time. Mr. Klein invented the electric wheelchair which could be controlled by a joystick, headswitches or even a sip-and-puff method that made it possible for quadriplegics to have increased independance and mobility. George Klein was made an Officer of the Order of Canada and was inducted to the Canadian Science and Engineering Hall of Fame for his contributions to the medical field. Born in Winnipeg, Manitoba, Dr. John Hopps invented the world’s first external, artificial pacemaker. Dr. Hopps realised that a stopped heart could be restarted by electric stimulation. He invented the pacemaker, a device that can regulate the heart’s beating by means of a series of electrical impulses. Measuring over one foot in length, the first pacemaker was an external model, but subsequent improvements to the design allowed it to be miniaturized and implanted in a patient’s chest. Dr. John Hopps was made an Officer of the Order of Canada in 1986. Mike Lazaridis was born in Turkey and emigrated to Canada with his family at the age of 5. He was interested in science at a very early age. He eventually founded Research In Motion, the company which created and manufactures the BlackBerry wireless device. One worker at RIM remembers being told, ‘We’re going to make a wireless modem the size of a credit card!’. The BlackBerry is more than a wireless phone, it permits wireless access to the worldwide web, as well as countless organizational features. No one can deny the impact that the BlackBerry has had on our modern society.